Every order placed through Baptist Wholesalers supports planting new Bible-believing Baptist churches in the United States! Click here to find out more! The Blood is still there! We've hand-selected these old-time, tried and true favorites for your church. Favored hymnals by most Old-Time Baptist Churches! NOTE: Prices and availability shown on this page are subject to change without notice. The All American Church Hymnal contains a collection of songs which have proven to be especially meaningful, resourceful and inspiring while representing the most beloved expressions of faith found in churches across the country. 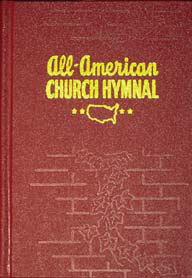 This hymnal remains “All American” and is rich in its expression of the Christian faith this country was founded upon. NEED A PIANIST LOOSE-LEAF COPY?? ASK US ABOUT HOW TO GET ONE MADE FOR YOU! The original looseleaf is not longer produced due to copyright issues. Paymet notes: We accept credit card payments for our hymnals, but greatly appreciate payment by check instead due to high credit card processing fees on each order. Your consideration is appreciated. For your convenience, there is a printable order form here for check orders. Compiled and edited by master songwriter and arranger John W. Peterson, Great Hymns of the Faith is a collection of lasting, classic hymns and is designed to meet the needs of congregations, choral groups and families with a strong appreciation for the traditions of the church. Hymns are arranged by topic, with generous cross-referencing for hymns with available alternate tunes, hymns with similar meter, or locations of the same hymn tune in an alternate key. Responsive readings (KJV), an index of songs taken from scripture and a comprehensive topical index combine to make Great Hymns of the Faith a classic worship tool and a resourceful reference guide to timeless hymnody. 548 Songs, Topical song index with 113 headings, Metrical index, Alphabetical index of titles and first lines, 58 Responsive readings (KJV), Calls to worship, Benedictions, Index of selections from scripture. Media mail rates available for lower costs but requires longer shipping times. 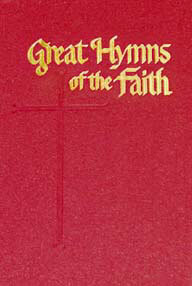 Minimum shipping is $18.50 for 5 or more hymnals. call for cost prior to ordering. USPS Priority Mail available upon request for some orders. *Subject to change without notice. Call to make sure of current shipping costs, or to enquire for larger hymnal orders. International & Canadian orders must contact us first for shipping and pricing verification. Non-US currency exchange rates and bank fees may apply and added to your order.